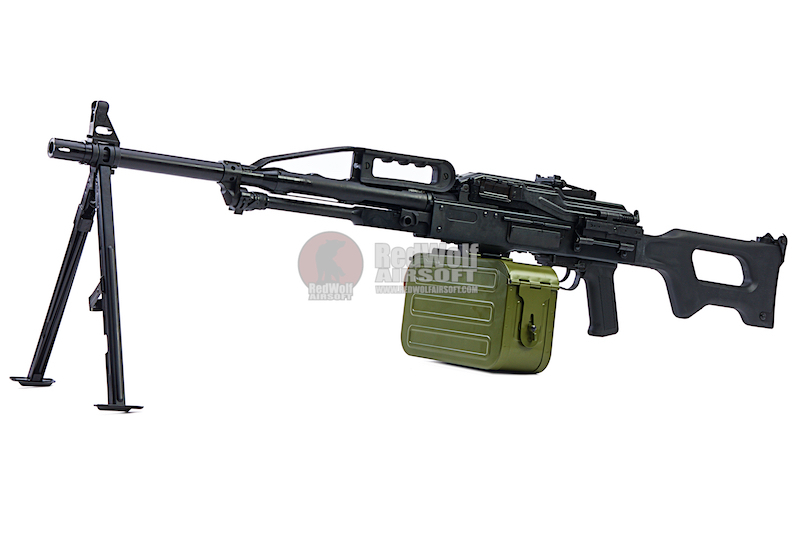 Full metal LCT PKP AEG. Can be dissembled into 3 parts. 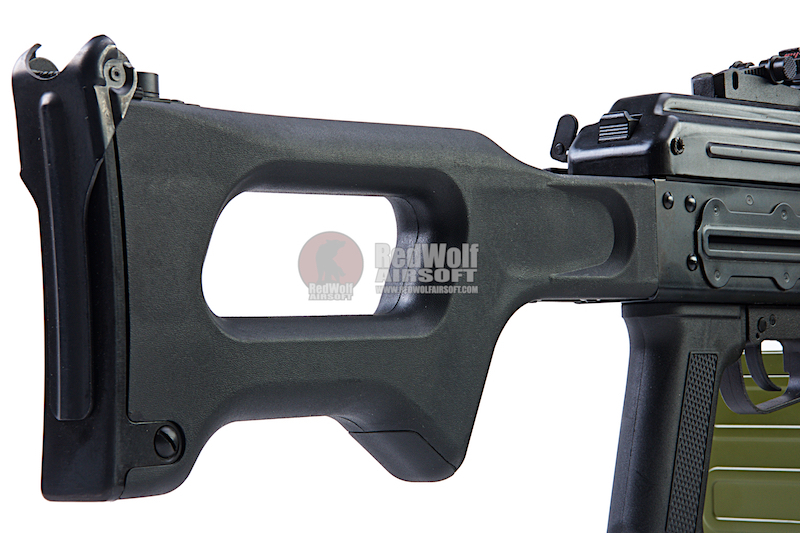 Compatible with LCT M60 internal parts. The PKP Pecheneg (Pulemyot Kalashnikova Pekhotny "Pecheneg"), is a Russian 7.62x54mm general-purpose machine gun. 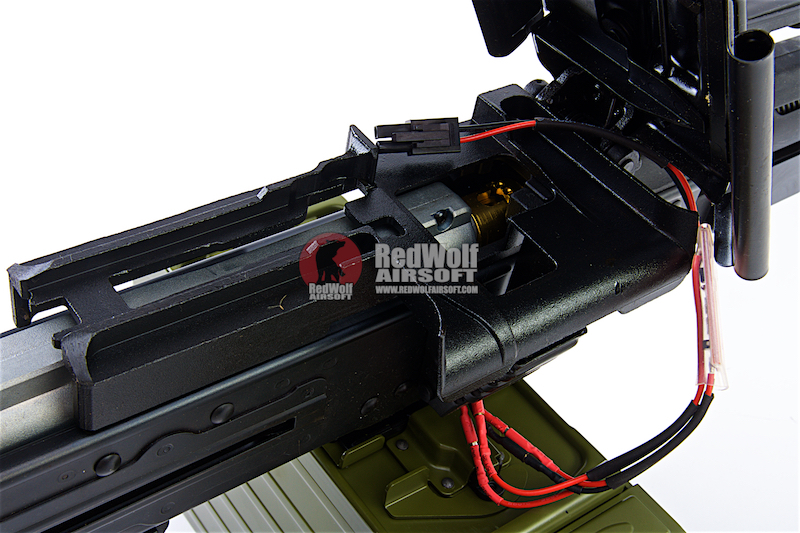 It is a further development and modification of the PK machine gun. It is said to be more accurate than all its predecessors due to a heavier, non-removable, forced-air-cooling barrel with radial cooling ribs and a handle which eliminates the haze effect from hot gases and keeps the barrel cooler, making the weapon more reliable. Furthermore, the weapon is capable of having a telescopic sight or other sights mounted on it, increasing its accuracy and effective range. 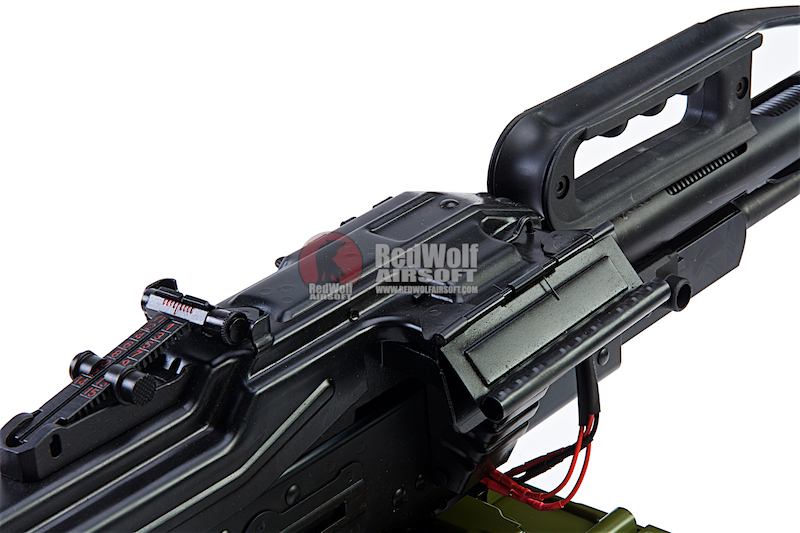 The PKP Pecheneg comes with an integral bipod and was intended to be used as a squad support weapon. 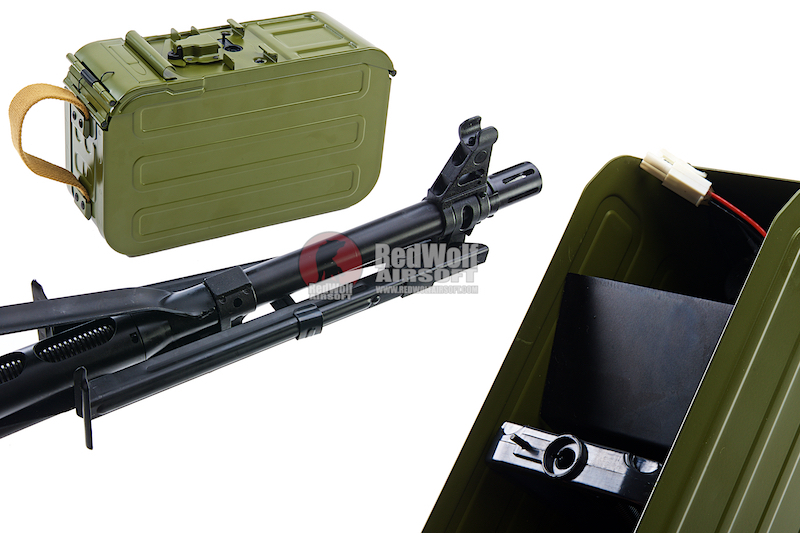 It can provide more sustained firepower than the standard-issue RPK-74, and the 7.62x54mmR cartridge offers a longer effective range and better penetration of light structures and improvised covers in urban and forest environments. 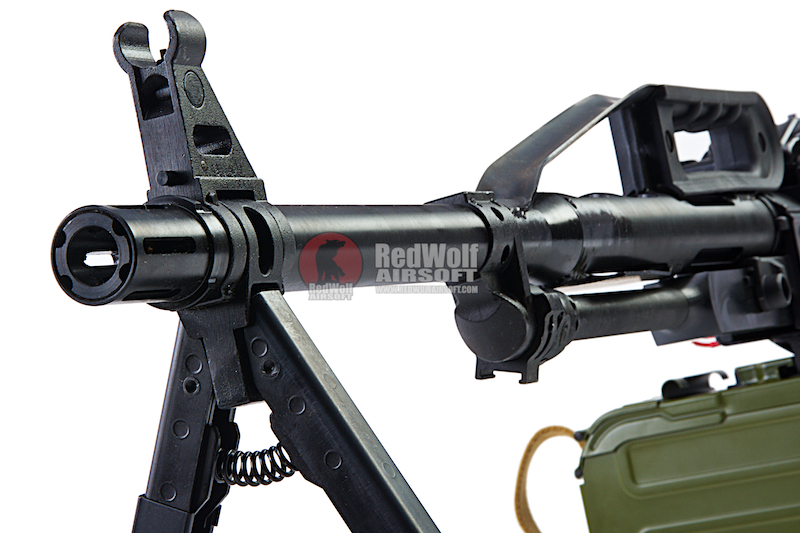 The airsoft version of this gun is a faithful reproduction of the machine gun mentioned above. 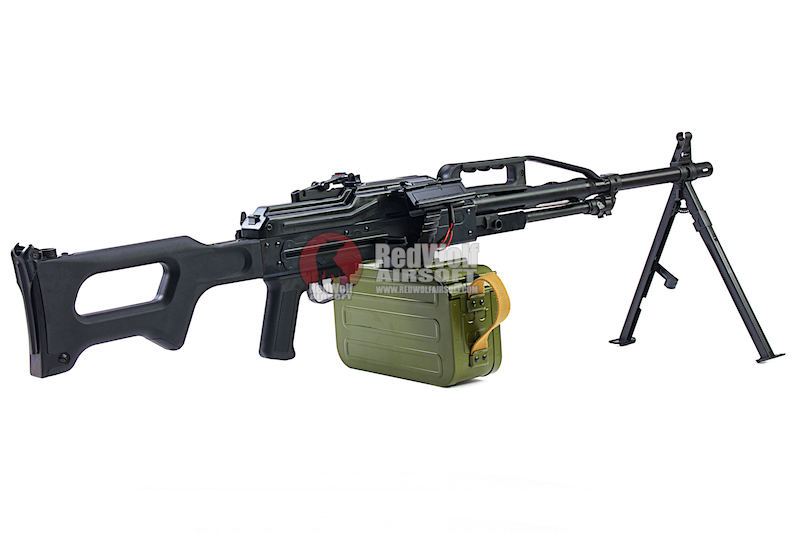 The key is LCT has designed their internals for the PKP in the same fashion as their other machine gun, the M60. Not only was the internals of the PKP well thought out, meticulous attention was paid to the external build quality. As stated, this gun is a faithful reproduction and you will be satisfied knowing that it exudes the same strong, robust, Russian aura that you would expect from a gun of this caliber, its bound to make a statement whither on the field or in your personal collection. LCT is a Taiwanese company that makes high quality airsoft products with a specialization in the reproduction of Russian small arm replicas. LCT has brought some truly standout products such as their AK lineup to their beastly M60. x1 5,000 Rnd Box Magazine.